Laurie Holden was on Twitter tonight, talking with fans and answering questions -- and of course almost all of it centered on her three seasons with AMC's The Walking Dead, the biggest genre show of its generation and one that has helped shape the face and reputation of the network on which it's aired. Of course, this is the second time in her life that Holden has been involved with a show that could be described that way. Prior to zombies ,she faced down alien soldiers and government conspiracies as an informant (and later lawyer) for Fox Mulder on FOX's The X-Files. So certainly not a "no," and by the way many news sites read such things, that could even be construed as "teasing" something. We'll just say this is her not ruling anything out, though, and leave it at that. In all likelihood, Holden hasn't been called yet one way or another; her character appeared periodically but wasn't a major enough player to merit being called in before the ink is dry on Mulder and Scully's contracts. 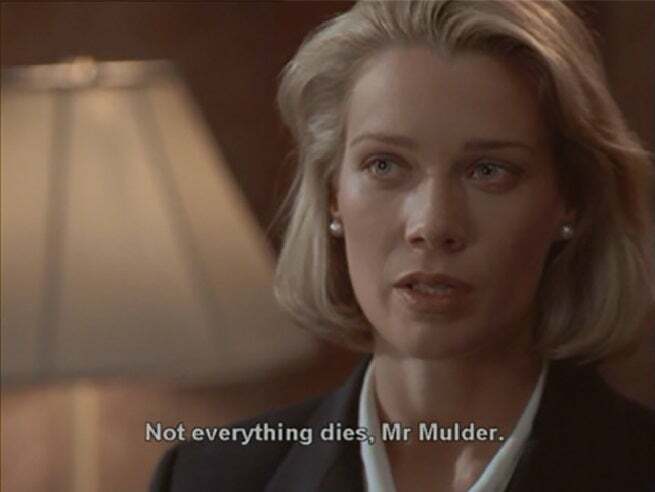 That said, it would stand to reason that her character -- a high-ranking government official sympathetic to Mulder's crusade -- might be one to bring back in the forthcoming revival miniseries. That Holden is, because of The Walking Dead, an instantly recognizable actor can't hurt her chances either. More coming soon on The X-Files.